Not quite…but I used what I had in the pantry and freezer…. After watering my growing (finally!!) garden this morning, I sat on the front verandah with my laptop and watched my daily Greek cooking show..Chef ston Aera…Love it especially when Eleni brings on chefs or cooks who make traditional dishes or traditional dishes with a twist..Today's episode the guest chef cooked a trahana, risotto style as opposed to the traditional soup method. Looked amazing..He also made a traditional bakaliro (bacalao aka baccala aka bakaliaro depending on which country you are from) dish from Kalamata.. It looked delicious so I thought I would make it with the bassa fillets I had in the freezer. No need to rehydrate and unsalt the bakaliaro.. That would have taken literally a whole day. I sautéed the sliced onion in olive oil, added the chopped garlic, sultanas, squeezed in the balsamic glaze and fig petimezi, gave it a good stir and added 1/2 can of crushed tomatoes. I then let it simmer for about 10 or so minutes on a low heat until the onions where soft and sultanas where plump and juicy. 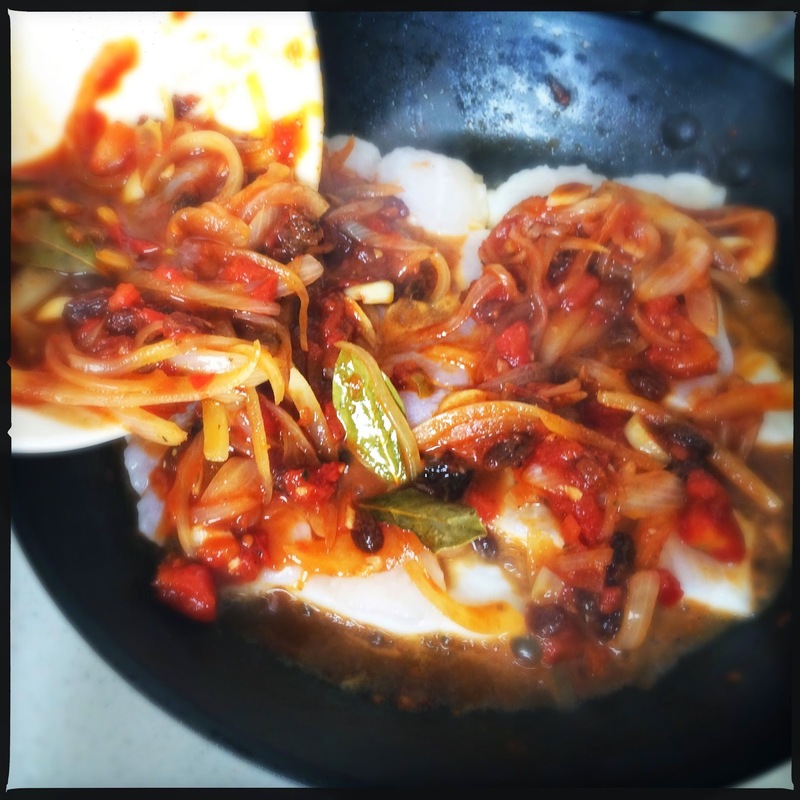 I removed the sauce from the pan into a bowl, added the sliced tomato to the pan then laid the fish on top of them. 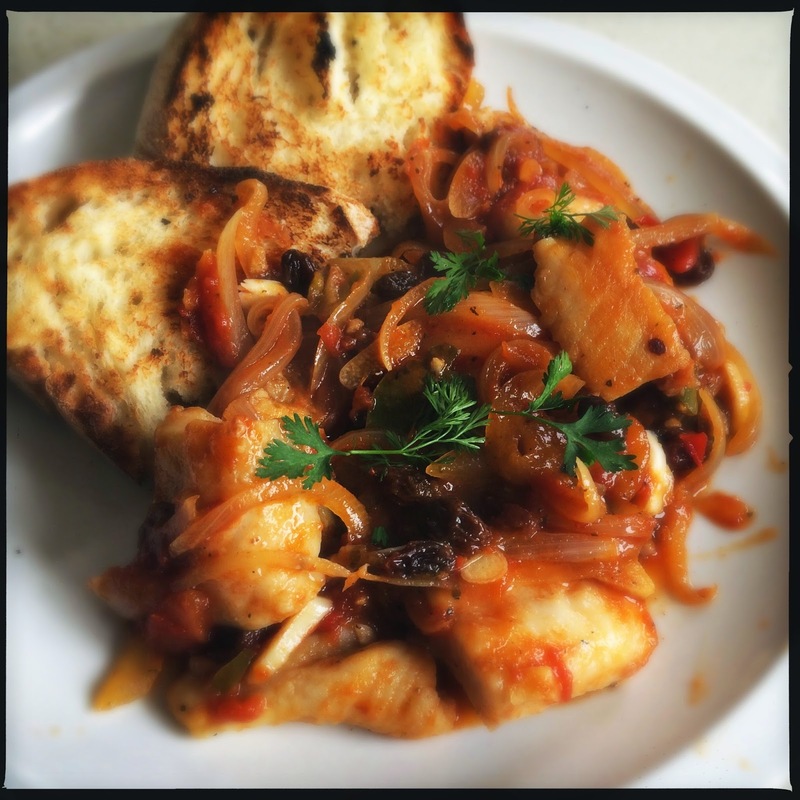 I then poured the sauce over the fish, closed the lid, let that cook for about 3 minutes and voila…..Serve with crusty bread.. The whole process took about 15 minutes. Will definitely make this again and try it with bakaliaro..